From 2002 through 2010, Harry Smith co-hosted CBS's The Early Show, currently the third-place broadcast network morning news program. Smith previously co-hosted CBS's This Morning from 1987 to 1996 while also serving as a contributor to the CBS Evening News, 48 Hours, and various documentaries. In 1996, Smith left CBS to narrate various programs for the History Channel and A&E's Biography. Smith returned to CBS in 2002 to replace Bryant Gumbel as co-host of The Early Show; he also occasionally fills in as host of Face the Nation and anchor of the CBS Evening News. In November of 2010, it was announced that Smith would leave the Early Show, effective January 2011. – Smith on The Early Show, November 7, 2008. – Smith on The Early Show, November 17, 2008. 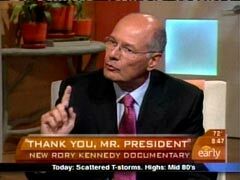 – Smith on The Early Show, August 29, 2008, the morning after Barack Obama's convention address. "March saw the best stock market gains in some time, deaths in Iraq are at their lowest level in six years, and we just saw CIA drones successfully kill another al-Qaeda leader in Pakistan. I have to ask, has Barack Obama caught on to the job of President in record time?" — Harry Smith to political analyst Craig Crawford on CBS's Early Show, April 1, 2009. – Smith on CBS's The Early Show, June 4, 2009. 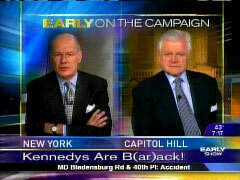 – Smith on The Early Show, January 29, 2008, discussing Senator Ted Kennedy's endorsement of then-candidate Barack Obama. – Harry Smith, March 2, 1990 CBS This Morning. – Smith commentary, May 4, 1992 CBS This Morning. – Smith, February 2, 1990 CBS This Morning. – Smith, December 29, 1990 CBS This Morning. – Smith to Newt Gingrich, September 30, 1994 CBS This Morning. – Smith in his weekly 'Record of Who We Are' commentary, June 1, 1990 CBS This Morning. – Smith reviewing TV commercials from previous campaigns on The Early Show, March 10, 2008. – Smith to media expert Robert Thompson on The Early Show, November 18, 2003, the day after Rush Limbaugh ended five weeks of treatment for drug addiction. – Smith to Newt Gingrich, April 4, 1995 CBS This Morning. – Smith to Republican Senator John McCain on CBS's Early Show, April 23, 2009. – Smith, October 12, 1992 CBS This Morning, to pundit Fred Barnes following the first presidential debate between President George H.W. Bush and Arkansas Governor Bill Clinton. – Smith introducing an interview with Sally Bedell Smith, author of a new book on the Clintons, on the October 23, 2007 Early Show. – Smith, September 28, 1990 CBS This Morning. – Smith on The Early Show, August 14, 2008. – Smith on The Early Show, November 2, 2007. – Smith's questions to Mario Cuomo, December 30, 1995 CBS This Morning. Co-host Harry Smith: "He bore the unspeakable grief and overwhelming hopes of a nation....Over five decades, Ted Kennedy carried the torch passed on by his brothers, for civil rights, for the poor, and for the sick." 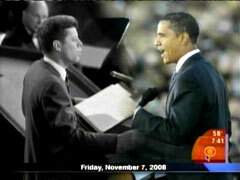 Clip of Ted Kennedy, 2008: "The hope rises again, and the dream lives on." — CBS's Early Show, August 26, 2009. – Smith on CBS's Early Show, May 15, 2009. – Smith to Senator Ted Kennedy on CBS's Early Show, September 9, 2003. An official investigation had already discredited the BBC story claiming Blair 'sexed-up' the British report. – Smith to National Security Advisor Condoleezza Rice on the November 28, 2003, Early Show. – Smith on The Early Show, December 16, 2008. – Smith in his Friday CBS This Morning feature 'The Record of Who We Are,' August 31, 1990. – Smith on The Early Show, February 9, 2007. – CBS's Early Show, March 26, 2008. – Smith to CNN's Lou Dobbs and Governor Bill Richardson (D-NM) on The Early Show, April 11, 2006. – Smith to CBS News consultant Fouad Ajami, May 31, 1996 CBS This Morning. – Exchange on CBS's Early Show, January 29, 2008. – Smith to Democratic National Chairman Terry McAuliffe on The Early Show, November 6, 2002. – Smith to incoming Senate Majority Leader Trent Lott on The Early Show, November 6, 2002. – Smith responding to Pat Buchanan's criticism of the 'Reinventing Government' report, September 8, 1993 CBS This Morning. — CBS's Harry Smith to Elizabeth Warren, chairman of the congressional oversight panel for TARP funds, October 22, 2009 Early Show. — Fill-in anchor Harry Smith talking about the signing of the health care bill on the March 23, 2010 CBS Evening News.